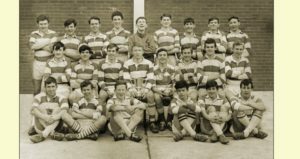 As Captain of Synge Street Past Pupils Golf Society for 2016 I invite and encourage all former pupils to join myself and old friends for my Captains day on Thursday 21st April in Grange Golf Club, this is always an excellent day in the good company of Synger old and not so old boys, it is good fun and informal, if you have a fellow golfer who was not in Synge Street and you wish to bring them as a guest you are more than welcome to do so. The Society only have two outings in the year the second being the Presidents (Fergus Flanagan) Prize on 15th. September in Castle Golf Club again another enjoyable event. We have been so lucky over the years to play in two of the best golf courses in South Dublin mainly due to the infiltration of these clubs by very many Synge Street past pupils and indeed Captain of Grange this year is a former Synger man Donal Bollard and Captain of Castle is Paul Williams another Synger man, both clubs have had many Synge Street Captains in the past. I have to say that I was delighted and privileged to be asked to be Captain of your society and I look forward to meeting you on these days.